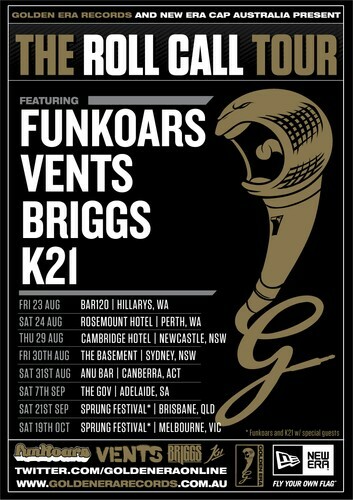 Funkoars, Vents, Briggs and Golden Era's newest signee K21 will be embarking on a six city tour in support of the 2013 Golden Era Mixtape. The 2013 mixtape is the 3rd free Golden Era mixtape in as many years. The tour will see the Golden Era artists perform tracks from the mixtape that would not normally be performed on the individual artists tours as well as new material and older classics.